Insurance is not included in the tour price. Credit cards are not accepted. Reservation one week in advance is requested. Tour guide Takashi reconfirms your application. Cancellation fee is imposed 50 % of the guide fee in case the cancellation is done within 3 days before the operation date. Customers are requested to pay the guide fee in cash at the end of the service. To make a reservation, send an email to me with (1)your name (2)name of your country (3)number of participants (4)desired tour date (5)name of your hotel at Takayama. Admission fees per person, Takayama Jinya: \430, Kusakabe Folk Museum: \500. Personal expenses are not included. The tour starts at 8:30 Am.or 1:00Pm. and ends at 12:30Pm.or 5:00Pm.We will meet at your hotel lobby in Takayama, or JR Takayama station. The tour ends at your hotel, or wherever you want to disband in Takayama. Hida-Takayama is located in the Takayama Basin at an altitude of about 600 meters. The city area is surrounded by mountains and forests. More than 90 percent of the Hida region is a forest area. It is said that the city originally developed by skilled wood-craftsmen about 1,300 years ago. Carpenters in this region were sent to Nara and Kyoto, the old capitals of Japan, to work for construction of Imperial Palaces and Temples. In the Edo period of about 400 years ago, the Kanamori family, a local lord of Takayama, built a castle and merchant districts spending 16 years. Generations of the lord Kanamori ruled this region for 107 years. 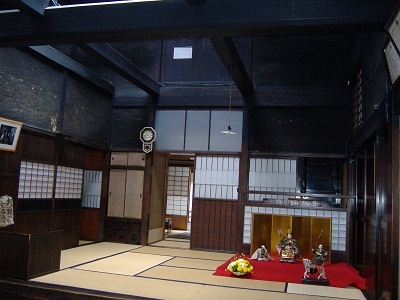 During Kanamori reign, traditional arts and crafts such as Shunkei-Nuri Lacquer-ware , woodwork and tea ceremony were thrived under encouragement and sponsorship of the lord Kanamori. All of a sudden, the Tokugawa Shogunate relocated the Kanamoris to the Tohoku region and directly controlled this region for 177 years. The financial difficulty of the Tokugawa Shogunate is said to be one of the reasons for the surprise relocation. 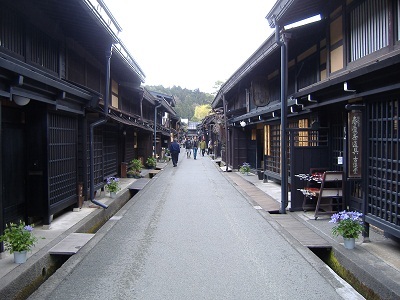 Merchant houses of the Edo period still remain today in Sanmachi and Shimoninomachi-Oshinmachi districts. Tall white earthen walled storehouses called Yataigura are scattered along the roads of merchant districts, which not only house floats for Takayama festival, but also work as fire walls. These two districts are designated as the Preservation Districts for Groups of Traditional Buildings. The lines of latticework windows painted with black ocher are impressive. Takayama is also famous for its festival, one of the three most beautiful festivals in Japan. It takes place twice a year, the Spring Festival and the Autumn Festival. Spring Festival proceeds during April 14 and 15 with 12 floats procession, and the Autumn during October 9 and 10 with 11 floats. In this tour, Takayama jinya, morning market, Sanmachi district and Kusakabe folk museum are the places to visit.